At the foot of the Mayacamas mountain range, the historic Charles Hopper Ranch hosts Ulysses’s 35-acre vineyard. A picturesque wine country setting, farmhouse, wooden barn water tower, bright yellow mustard flowers bloom among the vine rows. Christian Moueix, Bordeaux’s Pomerol superstar and owner of Napa’s Dominus Estate, bought this estate in 2008 and has been pulling out merlot vines and planting cabernet franc and cabernet sauvignon, with certain of the vines sourced from top Bordeaux vineyards. Winemaker Tod Mostero, said due to climate. “Ulysses is colder in winter, warmer in summer,” That translates into softer, plusher tannins. 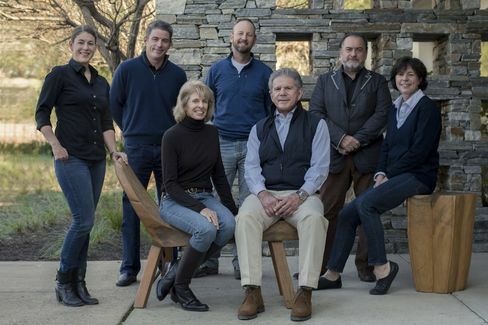 Bart and Daphne Araujo, sold their cult winery Araujo Estate in 2013 to billionaire Francois Pinault, of Chateau Latour, and then quickly founded Accendo Cellars, which will release its 2014 Sauvignon Blanc in April and its first Cabernet in September. “Pinault’s offer came out of the blue,”… “He was the right buyer at the wrong time. We had no interest in retiring.” With no succession plan they decided to sell early and quickly move on to a new project…... “We decided to do something different,” said Bart. Instead of a single-vineyard cabernet like Araujo Estate, the first Accendo Cellars red is a blend from five top vineyards, including a couple that the Araujos own. This uber-blend (as they call it) pay homage to Napa’s history in the 1960s and ’70s, before astronomically priced single-vineyard wines became the rage. The 2014 Sauvignon Blanc will be available in April for $50. The 2013 Cabernet Sauvignon (not yet priced – 550 cases) is their first vintage.